William Saroyan was born in Fresno, California, on 31st August, 1908. Saroyan left school at fifteen but continued his education by reading books in the public library. His first collection of stories, The Darling Young Man on the Flying Trapeze appeared in 1934. This was followed by Inhale and Exhale (1936). Saroyan became involved in the Group Theatre in New York where he worked with Harold Clurman, Lee Strasberg, Elia Kazan and Clifford Odets. Members of the group tended to hold left-wing political views and wanted to produce plays that dealt with important social issues. The group produced his play, My Heart's in the Highlands (1939). The following year he was awarded the Pulitzer Prize for his play The Time of Your Life, but he rejected it. 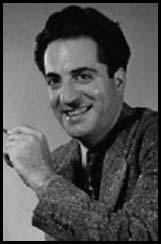 Saroyan's later work includes the autobiographical My Name is Aram (1940), Dear Baby (1944), The Human Comedy (1943), Mama, I Love You (1956), Papa, You're Crazy (1957), One Day in the Afternoon of the World (1964) and Places Where I Have Done Time (1975). Saroyan wrote three volumes of autobiography: The Bicycle Rider in Beverley Hills(1952), There Goes, You Know Who (1961) and Obituaries (1979). William Saroyan died on 18th May, 1981.